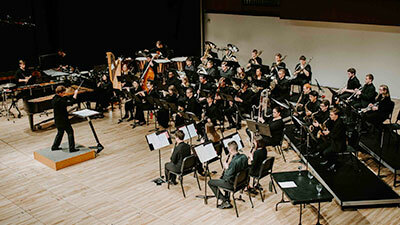 The Wind Ensemble is the university's premiere concert band. Its select mission is to provide instrumentalists of advanced technical proficiency a pre-professional ensemble experience. With an emphasis on contemporary American compositions, the Wind Ensemble's repertoire reflects the most recent technical and textural innovations, as well as the rich tradition of wind and percussion music extending back to the Renaissance. The objectives of the Wind Ensemble are to rehearse and perform repertoire of the highest caliber, encompassing the broadest possible spectrum of styles; to develop a high degree of refinement and independence in students' ability to communicate musically in both chamber and larger ensemble settings; and to provide, through the study of the masterworks of the wind band repertoire, an anthology of styles, performance practices and techniques that will serve as the foundation for students' ability to realize their professional musical aspirations. Membership in the Wind Ensemble is determined by audition each semester, and music majors as well as non-majors are encouraged to try out. Audition music and schedule information can be obtained at https://www.unl.edu/band/concert_audition.shtml. Contact Carolyn Barber for additional information.